The Ultraskiff 360 looks like it’s the Millennium Falcon for the water. Or maybe it just looks looks like a bumper boat. On steroids. Appearances can be misleading though. Underneath the surface of this big round boat there’s something for everyone. You can use this bad boy for..
What sticks out most on the Ultraskiff 360 is the overall versatility. It can be broken down to only the round boat itself with no attachments so you can transport it, store it, and move it much easier than a regular boat. 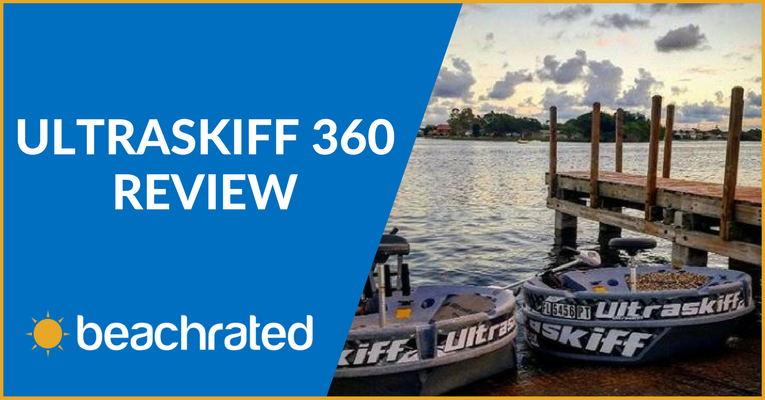 In this review of the Ultraskiff 360 we’ll look at..
How big is the Ultraskiff 360? Not that big when compared to any bay boat you make take out on the water, or anything with a decent sized engine. The diameter of the Ultraskiff is 72”, or 6 feet. It’s a perfect circle. The height from the bottom of the round boat to the top is 20”, or 1 feet 8 inches. If the material wasn’t very buoyant (it is….read below) then you would probably be concerned about the 20” height, but you won’t have to worry about sinking down too low. One of the advantages the Ultraskiff 360 has over other boats is the ability to sit higher – allowing you to see into the water more clearly. This round one man boat only weighs 123 pounds, and the detachable pedestal weighs only 5, but will easily float just about anyone (more on that below). The advantage that anyone (no matter what their size is) has here with the Ultraskiff 360 is the ability to freely move about in 360 degrees. And that’s why so many people love this thing. 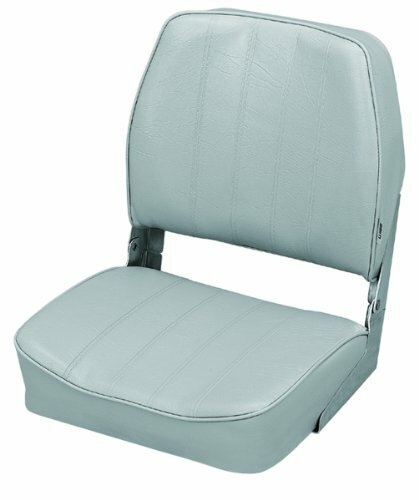 You’re not restricted to heading in 1 single direction, and you can swivel on your chair and cast every which way. Additionally, you can take the Ultraskiff with you anywhere. Don’t have a boat trailer? No problem. You can easily stack two ultraskiff boats side by side in the bed of a truck, strap it down with some ratchet straps. The Ultraskiff 360 is made of rotomolded polyethylene. Just like some of the coolers we looked at awhile back. Rotomolded polyethylene is also present in some of our favorite fishing kayaks too so that should tell you right off the bat that this round boat won’t be sinking on you once you take it out. 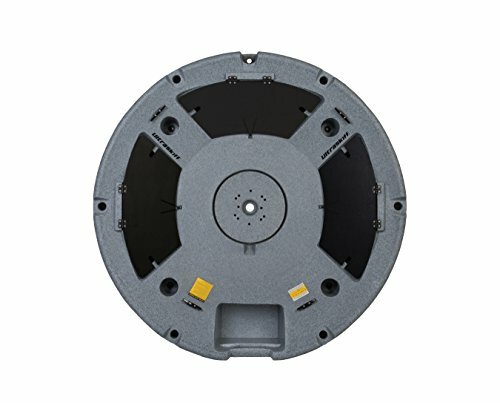 All of the hardware present throughout the internal components of the Ultraskiff 360 is all stainless steel machine screws that are attached to either brass, or stainless steel molded in inserts. Worried about sinking down too low? Don’t be. The weight limit that Ultraskiff posts to their site is 460 pounds! Making this a good option for heavier set people if you don’t want to go the fishing kayak route. The large surface area for the Ultraskiff 360, and the material used makes it practically unsinkable. Here’s a video we found of a 375 pound man comfortably fishing from the Ultraskiff 360, and moving about freely. Where are you going to put your stuff? The Ultraskiff 360 comes with 3 storage compartments. If you’re facing forward and the trolling motor is directly behind you then you’ll have storage to your front, right, and left. Each compartment on the Ultraskiff 360 comes with a lid that has 2 slits on either side so you can use it to feed the wire from your fish finder through it. You can also use it for any rope you’re using to hold it secure to the dock, or any sort of hoses you may have on board (like hoses from a livewell aerator pump). Another really cool feature is you can use the underneath side of every lid as a cutting board for bait prep. And you can also see above that the battery compartment for the trolling motor is plenty big too. If you didn’t want to use a trolling motor you could use this for extra storage space. Ultraskiff sells this boat by itself, and with no added accessories. 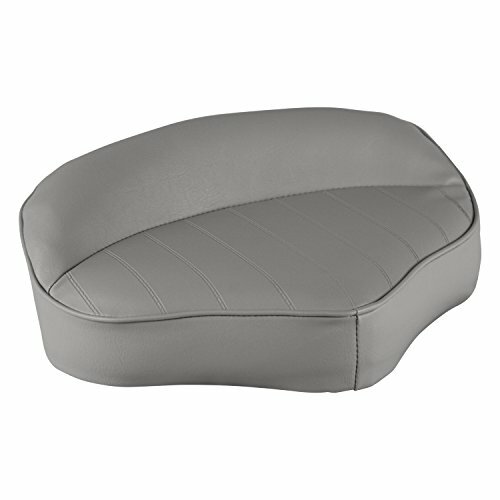 You can mount a casting seat that is more for active fishing and swiveling around at all angles, or you can get a regular boat seat for more relaxed ‘beer sipping’ fishing. And to point out, you may not even need a seat for the Ultraskiff if you’re just using it to get around the lake, or the bay and you have your towel laid out with your cooler sitting there. These are large enough to hold any larger size phone as well. They aren’t skinny cup holders so if you’re using 1, and the rest are free you can use them for storing other things like lures & bait, or even fishing pliers to get that hook out of your catch’s mouth. 4 5 inchCleats that you can tie the Ultraskiff down with. You can throw out the anchor if you don’t want to troll anymore and easily attach it to one of the cleats too. If you don’t need all 4 they have threaded inserts underneath so you can take them out and put in rod holders or fish finders. Within the perimeter of the Ultraskiff 360 there are 8 points that dip down that you can use to strap it down in the bed of your truck or to your trailer. The back part of the battery compartment (the biggest dip in the Ultraskiff hull) is also considered a strapping point. The Ultraskiff 360 comes with 6 flush mount rod holders. Although you can easily attach any swivel mount rod holder where the cleats are mentioned above it’s nice to have some holders included. These aren’t the type of skegs we mentioned that are on fishing kayaks. These skegs are much longer, and are actually part of the hull on the Ultraskiff itself. These are for tracking and protect the hull when you have it strapped down and you’re headed down the road. The Ultraskiff 360 is really for any type of water so the front part of the hull has a flare. The flare limits the water splash over the front of the boat, and allows you to head straight into swells – no problem. Don’t worry about scratching up the boat when you roll it, or bumping into the dock. That’s what the rollbar is for! 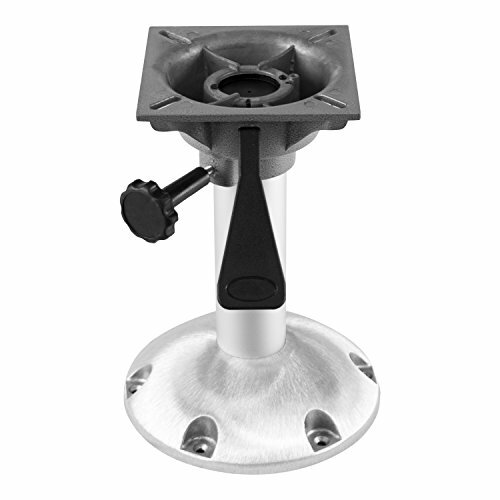 The only other thing you’ll need besides a casting seat or a boat seat that we mentioned above is a pedestal system to actually mount the boat seat on. The Ultraskiff is what you make it. If you’re an avid outdoorsmen, or you just want to slowly ‘putt’ across the water then the Ultraskiff 360 could be your new toy.